a brass ball and socket skeleton with a latex exterior. BAFTA and an Emmy Award as well as a 1st Prize at the Chicago Festival 1984. 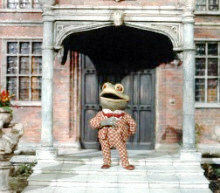 The film was the springboard into a seven-year love affair with Mr Toad and friends. more on Toad's antics in and around Toad Hall. Other film and television adaptations have come and gone before and after. of scale bewteen the animals and the human elements of their environment. sit in motor cars and talk face-to-face with folks in the courthouse and gaol. not a sleight on Cosgrove Hall's work, rather a flaw with the original novel.